A random selection of recent photographs that said more together as a group than I had anticipated. This series of photographic diptychs works to suggest or evoke narrative and/or imagist structures that implicate the viewer in the process of creation. 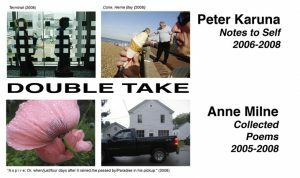 Hamilton artist, Peter Karuna is an independent videomaker, installation artist, and still-photography instructor. His work has been shown nationally and internationally, and is in several collections including the National Gallery of Canada.